ADR Centre, the dispute resolution wing of Civitas Legal Solutions along with Indian Chamber of Commerce and Industry, Mattanchery organized a seminar on 'Arbitration of Commercial Disputes' on 28th Januray,2012. Adv. Aravind Minocha, expert arbitrator and Advocate, Supreme Court of India was the main speaker. He stressed on the importance of arbitration as a tool for speedy dispute resolution. According to him, Courts should exercise restraint while interfering with arbitral awards, otherwise arbitration itself becomes meaningless. He also stressed on the need to promote arbitration institutes as it reduces cost, brings transparency and is professional in service. Responding to queries from participants, he also advised businessmen to be careful while drafting arbitration clauses suggested that in international contracts, it is always preferable to mention the place of arbitration as India. Adv. Jithin Paul Varghese, speaking on the occasion, explained the functioning of ADR Centre and Mr. S. Ramakrishanan, Secretary , Indian Chamber of Commerce offered felicitation. Event was attended by business men, chartered accountants and lawyers. Every year, hundreds of law students graduate from colleges and schools in India. But, how many of them are really equipped to become excellent lawyers? Do they have those specific skills that ensure their success? 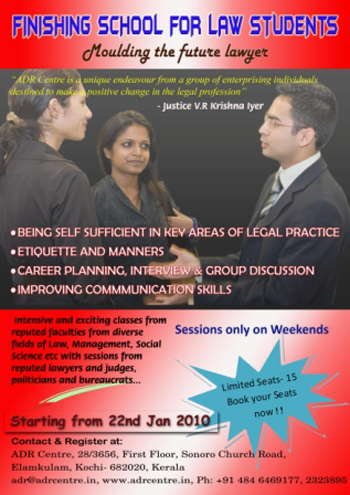 As an attempt to answer these questions, ADR Centre, Kochi, is organising a three-day residential certificate course, Finishing School for Law Students (FSL); one that provides unique insights into legal practice. This course is being conducted in association with the Centre for Public Policy Research (CPPR) and Civitas Legal Solutions, from January, 2012, at Ashir Bhavan, Kochi. 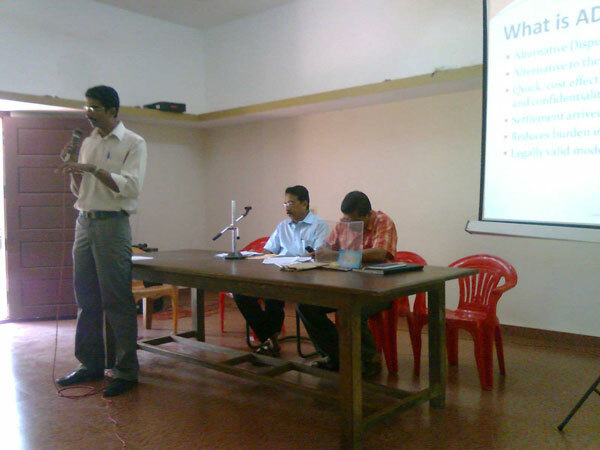 The second edition of Finishing School for Law Students was held from September 10-12, 2010, at Ashir Bhavan, Kochi. The three-day residential course that was attended by 18 law students from across the country was conducted by ADR Centre. The course was inaugurated by Dr N R Madhava Menon, a noted legal luminary. In his inaugural speech, he spoke on the topic, Legal Profession: Recovering from Self-inflicted Wounds and Search for Fresh Moorings, and said the legal profession had to adjust itself with the changing times. “Finishing Schools can help those students that are not fortunate to get plum jobs in mega corporations. It can enable them earn a decent living on their own, while serving people meaningfully,” Dr Menon said. Cochin Chamber of Commerce and ADR Centre jointly organized the seminar on the topic "Resolving disputes for a better maritime business" on 8th July 2010 at Cochin Chamber of Commerce and Industry. The seminar was to give the maritime professionals a better understanding of the various aspects of maritime dispute resolution. Adv. V M Syam Kumar spoke on the various disputes connected with maritime business focusing on how disputes affect the growth of business. The practice of alternative dispute resolution methods like face to face meetings, mediation and arbitration can improve business by minimizing legal costs, ensuring prompt dispute resolution and also preserving business relationships. Maritime dispute resolution is the alternative means of resolving problems outside the court. Alternative Dispute Resolution (ADR) mechanisms include arbitration, conciliation and mediation. The Finishing School for Law Students Course which was intended to broaden the horizon of a law student came to an end on February 28th, 2010. With an impressive array of resource persons drawn from various fields like Law, Politics, Press, Social science etc, it was a treat for the students. The sessions were entertaining with active interactions with the students on variety of topics. The Course was dovetailed to provide unique insights to a law student different from the academic lines taught in the Colleges. The ‘Reality speaking’ classes had the students experience the innumerable options in studying law. The course indeed facilitated the process of ‘Moulding the future lawyer’. 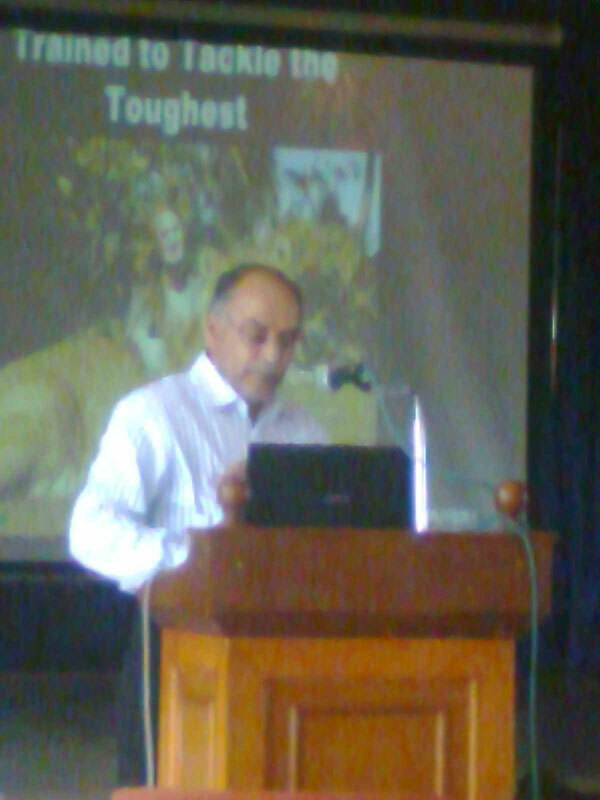 Prof Bhasker Iyer of TIME handled the language part with stress on Accent Neutralization and Voice Modulation. ADR Centre Co-ordinator shall join the Rajagiri team for conducting programmes in the scheduled areas as identified. By end of January both shall organize 20 programmes on an experimental basis to get the feel. In the initial 10 programmes, the Co-ordinator shall personally attend and co-ordinate the event. 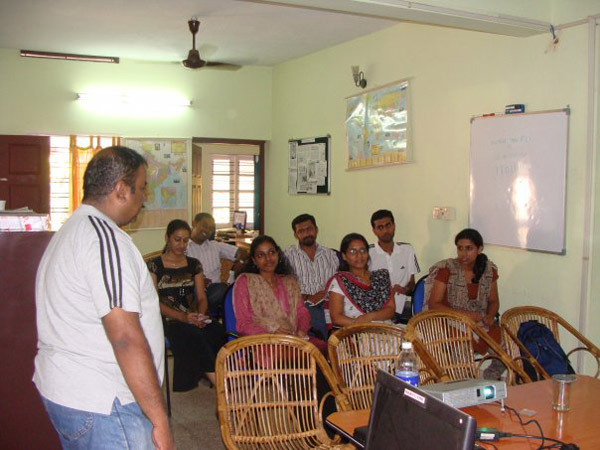 Further specific hands on training shall be provided to the Rajagiri Co-ordinators in Mediation and ADR Management. This shall facilitate and equip them to conduct and organize ADR Classes and awareness drives on their own. For this purpose ADR Centre shall share its resource bases and training materials and a time frame involved for that. The materials include flyers, posters, forms and other leaflets. The trained personnel’s shall then conduct or organize programmes on a monthly basis. ADR Centre shall facilitate all kinds of assistance to the same. The Centre is open to extend its office to the place decided by Rajagiri. 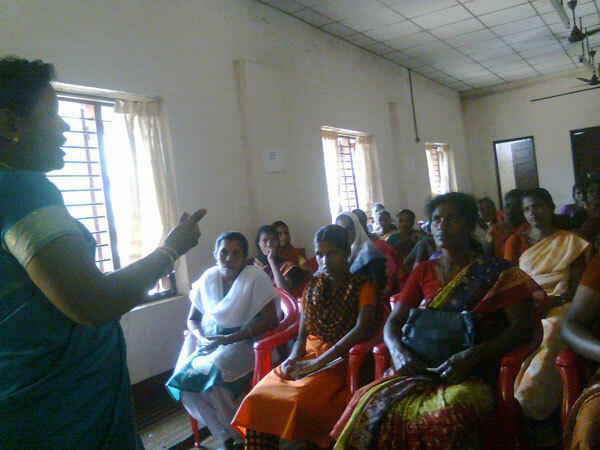 The programmes can be an extension of the Rajagiri outreach programmes with 20-30 minutes allocated for ADR awareness. Rajagiri and ADR Centre shall also organize ADR Centered programmes at the indentified places. It can also be a two day session with the first day as an introductory session and the second day with orientation and training of persons. Volunteers can be nominated from the group of persons with specific orientation provided to them. For all programmes, a register shall be kept for entering the total number of participants including their contact address. Feedback and grievance redressal forms duly filled by the participants shall be forwarded to the Centre after each programme. All queries shall be addressed by ADR Centre’s personnel and in fit cases through the Rajagiri personnel’s. Proper follow up will be done after each programme. Depending upon the response, Region wise programmes can be clubbed together and an Adalat can be conducted to redress the grievances affecting the people of the said localities. A panel of mediators and experts shall be constituted for the said purpose. For the programme, in addition to the people of that locality the Muncipality/Panchayath head shall be invited. Renowned persons living in the area shall also be invited with maximum publicity giving emphasize on the purpose of such an endeavour. In case any other issues are to be highlighted, then it shall also be included in the programme schedule. For Eg: AIDS Awareness, Swine Flu awareness etc. To instil in fresh law graduates the confidence and courage to start a new career and provide all the support for them to kick start their new career path. We at the finishing school are ready to take you in and provide you with all the possible support and guidance to transform you into an unmatched professional in your field of choice. A fresh law graduate is always apprehensive about his future; he is unsure about how and where to start and this could result in a lack of confidence and also could put him at a lower platform than others. The Finishing school aims to give you answers to all these questions. “Where Tradition meets tomorrow” – We, at the finishing school aims to provide those finer points of a social life which is quintessential for every lawyer in the present age, keeping in mind both the Indian and Foreign traditions in mind, from how to give a hand shake to how to speak on the phone and how to maintain an confident posture as well as how to speak fluently and effectively in public. The guidance doesn’t just stop there as we go one step further to ensure that the skills that you have learned at your institution are honed and perfected so that as you enter your profession, we would have polished you in every sense possible, making you aware of all those Do’s and Don’ts (P’s and Q’s) that are to be kept in mind while in a social group or in any other gathering. The ADR Centre was inaugurated by Justice V.R Krishna Iyer at his residence ‘Satgamaya’ in the auspicious presence of advocates, media, students and public. 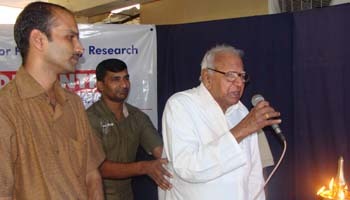 Justice V.R Krishna Iyer inaugurated the Centre by lighting the lamp and graced the occasion by his valuable words. This was followed by a screening of the documentary, ‘Justice V.R Krishna Iyer-The Living Legend’. Justice Krishna Iyer spoke gracefully and graciously with the real intent to have more ADR Centre like the present one in the country. He said ADR Centre is a purpose, a mission which can be carried out through popular cooperation. The people are aware of the causes of delay in the courts. Most often after the case, both the parties are left bankrupt which shows the need of Alternative Dispute Resolution Centres. 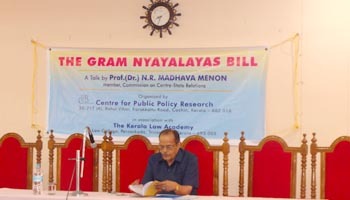 Talk by renowned jurist N.R Madhava Menon on Gram Nyayalaya Bill was conducted on 8th February 2009 at Kerala Law Academy, Thiruvananthapuram. The concept of Gram Nyayalaya has been a debated issue for a long time and effort to bring the concept to help the rural people was delayed for a long time. The present Bill is a welcome relief to those sections of the society who have been deprived and been suffering from injustice or delayed justice. Dr N.R Madhavamenon who is aptly called the father of Nation law Schools also deserve the rare distinction of been the pioneer of the masses for having brought out the concept of Gram Nyayalaya. He had given his service to the Committee under Justice V.R Krishna Iyer which discussed the issues affecting harijans, women, poor and needy. He brought into light the caste system which was prevalent in India, which was according to him a cause for severe injustice to the people. 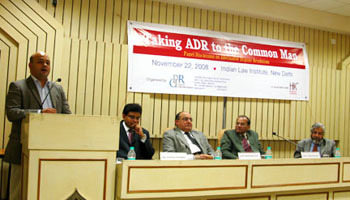 A panel discussion on ‘Taking ADR to the Common Man’ that was organised by The Centre for Public Policy Research in association with HK Legal on 22nd November, 2008. The detailed report of the discussion is detailed out below for your reference. The Panel Discussion on taking ADR to the common man was first of its kind with a brilliant line-up of high-profile and eminent speakers, most of them experts in their respective fields, which proved to keep in line with the highest tradition of legal discussions at the Indian Law Institute. The discussions as expected promised a balanced debate since there were proficient speakers on one side and vibrant audience on the other side. The session was conducted at the auditorium of Indian Law Institute, New Delhi and it discussed about exploring the viability of making ADR accessible to the common man and the challenges on the way.